Normally in these comic pack reviews, we review one figure and then the other. Not much point in that this time, since it's pretty much two of the same figure. Brilliant, ruthless, and ambitious. Tomax and his brother Xamot are near mirror images of one another. They have an eerie way of finishing each other's sentences, and each one can feel exactly what his twin is feeling. Their newly acquired command of the elite Crimson Guard forces gives them unimaginable access to and control over the influential worlds of government, business, and finance. Tomax and his brother use business fronts like the Arbco Bros. Circus for their Crimson Guard operations. Xamot and his twin brother Tomax look exactly alike, except that Xamot has a scar on his face, a reminder of why it's better to be the puppeteer than the puppet. Intelligent and ambitious, Xamot and his brother realized that real power wasn't found in frontline battles or get-rich-quick schemes, but in the manipulation of political institutions, corporate boardrooms, and financial markets. As commanders of the Crimson Guard troops, they can now control those avenues of power. 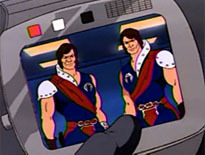 Tomax and Xamot, the Crimson Twins, were truly standouts on the cartoon, where their psychic connection was often played up to show one of them reacting to things the other experienced. In fact, that, along with their "mirror opposites" nature, became their defining characteristic - and it's something that was't even referenced on the filecards until the time of SpyTroops. The twins are looking pretty good in this update. They're muscular enough to beat the crap out of someone in a straight fight, but also thin enough to pull off their crazy acrobatics. They share the same body with a few minor changes: back in the 80s, when everything was a molded part of the figure, Tomax and Xamot required a lot more tooling to build; today everything from the neck down is duplicated, with the differences brought about by the add-ons. The twins are wearing matching blue uniforms, silver boots and black gloves. Each has a silver belt and codpiece, and a red sash across his chest. Shoulder armor and a high metal collar adorns one side of their bodies. They have red kneepads, and if you look closely, you'll see their "boots" are actually silver greaves worn over silver and red Cobra-branded shoes. A black communicator is worn on one wrist, and there's a pistol holstered on one thigh and a dagger sheathed on the other. 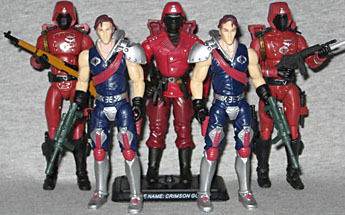 The Crimson Twins have a really sharp look, and these figures duplicate it well. 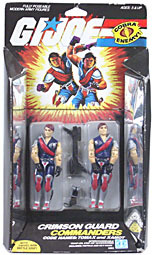 Above the neck, Tomax and Xamot diverge from previous incarnations. The figures look somewhat like Kevin Sorbo, and the art on the filecards looks like Sawyer from Lost. The original figures had well-coifed hair and roundish faces, while these are much more angular, and their hair is unkempt. The face isn't quite as broad as we saw in the old cartoons, either. Xamot's scar is sculpted and painted. The skin of their chests is a different color than the heads and arms - more red. Speaking of the cartoons, the Tomax and Xamot seen there didn't quite match the toys. 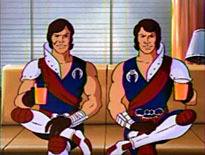 In fact, it was like their model sheets had been reversed: not only did they wear their shoulder armor on the opposite sides (Tomax on the left, and Xamot on the right), Xamot's scar had moved to his right cheek. Oh, and fun note: the twins were voiced by Corey Burton (Tomax, lower voice) and Michael Bell (Xamot, higher voice), who also voiced the Autobot "twins" Sunstreaker and Sideswipe, respectively. Ha! 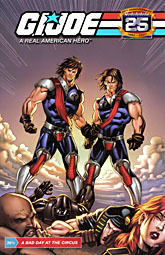 Tomax and Xamot's filecards refer to their place of birth as an "island in the Mediterranean," and that's generally been understood to mean Corsica - a reference to Alexandre Dumas' The Corsican Brothers, a story about Siamese twins who were separated at birth, yet share a psychic connection and feel each other's pain. Sound familiar? A bit smaller than Yellowstone National Park and birthplace of Napoleon, Corsica is technically a region of France, though the island is situated closer to Italy and its native language seems to be related to the Tuscan dialects. 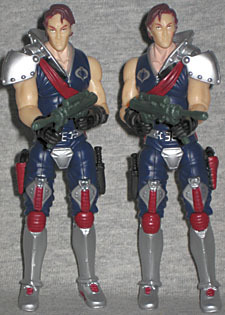 The twins' only actual accessories are matching green guns, unless you want to count the floating sash/armor. The guns and knives on their legs are molded pieces glued in place - that's how they can be on opposite sides but the figures still use the same legs. The communicators are separate pieces, too, but held on by the figures' gloves. Sadly, we don't get an update of the zipline the original figures came with. Even the packaging does its part to throw back to the olden days. 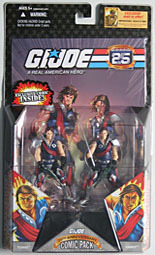 It's the same as all the other comic packs, but there are silver inserts in the sides that act as mirrors to play up the figures' design - in the '80s, Tomax and Xamot came in special packaging that did the same thing. It's not a direct copy of the old packaging, but it's similar, and it's obviously intentional. Cool little nod, that. This comic pack includes an all-new story written by Larry Hama and set in the continuity of the Marvel comics. Specifically, this is issue #36½, so it fits between #36 and #37. And if we actually put it there in the reading order, then that means Flint's first appearance has been bumped up an issue. Or half an issue. Whatever. 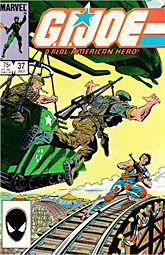 The story, "A Bad Day at the Circus," starts with a ceremony putting Tomax and Xamot in charge of the Crimson Guard, and what the rest of the Cobra upper echelons think about that. We meet the doctor working on the Freds (though they're still shown as blondes, rather than the proper redheads), and we even get and appearance from a young Kamakura. The art in this issue seems somewhat better than it was in the #33½ comic, but it's still jarring when compared to the '80s art. These days a two-pack of figures isn't a rarity, but back in 1985 it really was. Still, Tomax and Xamot remain unique. Their "mirror image" thing is cool, and the figures are made well. I'm not crazy about the faces, but this set is still worth owning - especially if you have a nice collection of Crimson Guards to flank them. How badass is that? Can you imagine comics being advertised on tv today?